1. In a small bowl combine canola oil, lime juice, lime zest, wasabi paste, soy sauce and sesame seeds; mix well and set aside. 2. Brush tuna pieces with canola oil. Sprinkle with salt and pepper. Coat tuna with chopped almonds. In a non-stick frying pan over medium heat, cook tuna in 1 Tbsp (15 mL) canola oil. Cook tuna for approximately 2 minutes on each side, or until done, turning once. Tuna should be rare. Set aside. 3. 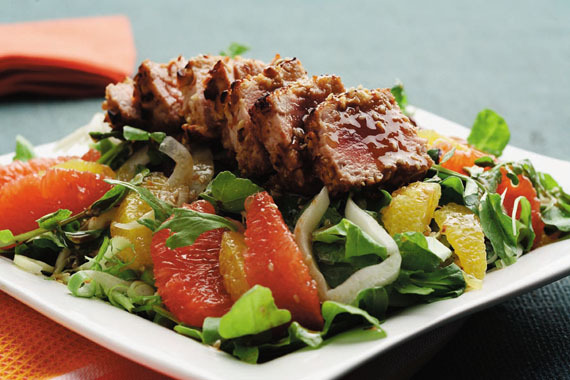 In a large bowl combine fennel, oranges, grapefruit, salad greens, green onion and watercress. Pour desired amount of dressing over salad ingredients and toss lightly. Divide salad among four large plates. Rearrange citrus fruits to make attractive presentation. Place one piece of tuna on top of each salad plate. Garnish with watercress or curled green onion. Drizzle with additional dressing if desired. Serve immediately.